In January,1895 after the engagement of his daughter, Frieda, to wealthy Felix Warburg was announced, banker Jacob Schiff purchased from Robert W. Tailor the limestone mansion at No. 18 East 72nd Street as a wedding gift. The 25-foot wide home, just around the corner from 5th Avenue and Central Park, was one in a series of stately French-inspired rowhouses. Sitting on a rusticated base with one wide, arched window balanced by the entranceway, it rose five stories. Supported by a stone cartouche among intricate carved leaves, the second and third stories bowed away from the façade, creating a stone balustraded balcony at the fourth floor. The Warburgs were generous philanthropists and were active in social issues. Here in December 1905 a meeting of wealthy Jewish New Yorkers was hosted to discuss providing education aid for Russian refugees. The relatively small house, however, proved inadequate for the Warburg’s growing family and social obligations. In 1908 they left No. 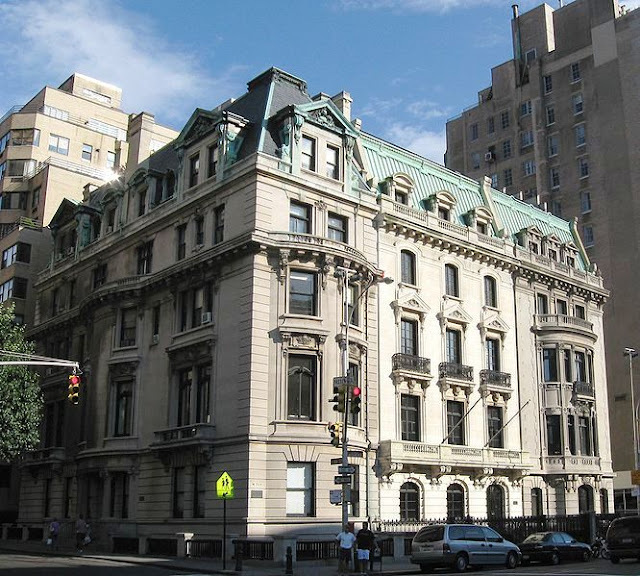 18 for their magnificent French Gothic chateau 20 blocks north on Fifth Avenue. Charles E. Danforth, a stock broker, purchased the house in January 1916 for around $200,000. His affluent neighbors included Louis C. Tiffany, Oliver Gould Jennings, W. Bayard Cutting and Lewis Cass Ledyard. A year before Danforth moved in, Turin-born businessman Alphonso P. Villa married Philadelphia heiress Helen Lippincott in St. Patrick’s Cathedral. Villa was the president of the Villa Silk Corporation. By October 25, 1918 when their first daughter, Elena, was born, the family was living at No. 18 East 72nd Street. The socially prominent couple would soon become the Count and Countess Villa and their home the site of glittering dinners and receptions. The four children – a son Anthony and sisters – grew up in a refined atmosphere of art and culture here and in their sprawling Tudor Revival estate in Newport known as Fairholme. Countess Helen Villa died in 1956. In 2005 interior renovations were done when the house became, briefly, the Mission of Spain to the United Nations. Today it is once again a stately private residence, the only home in the row to retain its original exterior architectural details and integrity. Mr. Moulton’s lofty prediction came close to falling apart within only eight decades. 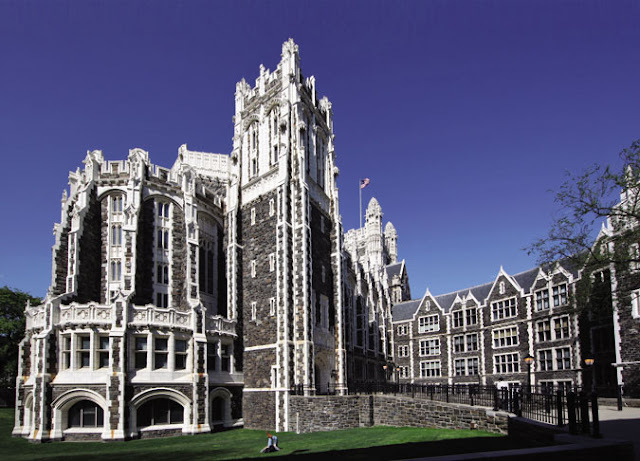 In the mid 1980’s the magnificent Shepard Hall of the City College of New York was in trouble. The building designed by George Browne Post was, quite literally, falling down. Large chunks of terra cotta routinely dropped from the façade and the 165' main tower was on the verge of collapse. Although Post -- most remembered for designing New York landmarks such as the Stock Exchange and Cornelius Vanderbilt’s gargantuan 5th Avenue mansion -- held a degree in engineering, the limited understanding of certain structural principles at the time would threaten his monumental structure within a century of its completion. 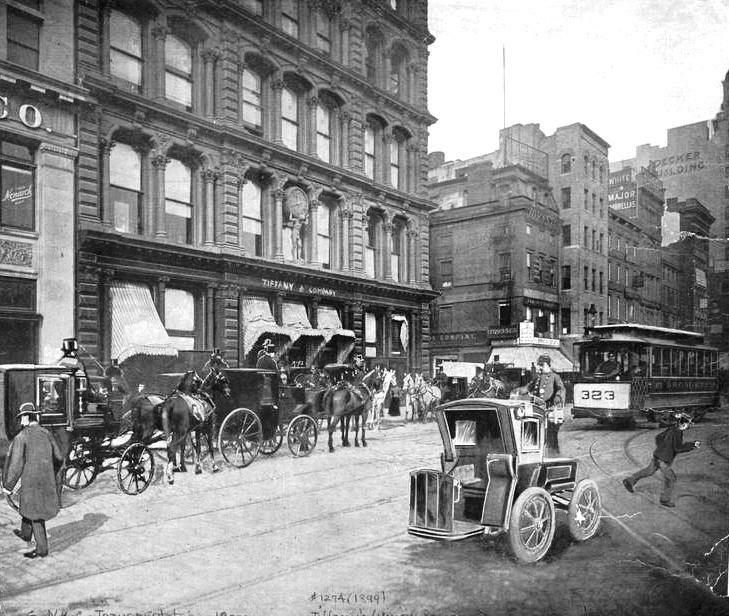 In 1900 the school, at the time called the College of the City of New York, had seriously outgrown its downtown facility at Lexington Avenue and 23rd Street. 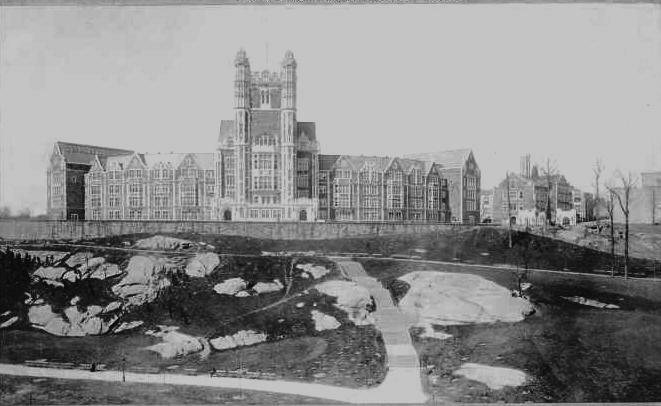 Land for a new campus was purchased that year at West 138th Street between Amsterdam Avenue and St. Nicholas Terrace. Post submitted his plans for a new structure in October 1902 which incited the press to dub them “luxury for students.” The gymnasium, for instance, would include a swimming pool, four handball courts, wrestling, boxing and fencing rooms and on the main floor an 8000 square foot exercise room. While The Times went into explicit detail regarding the various laboratories, recitation rooms and supply rooms, there was no mention of Post’s exterior architecture nor of the Great Hall, other than the hall would be “ornate in every detail” and would seat 2000 students, with 500 more in the galleries. 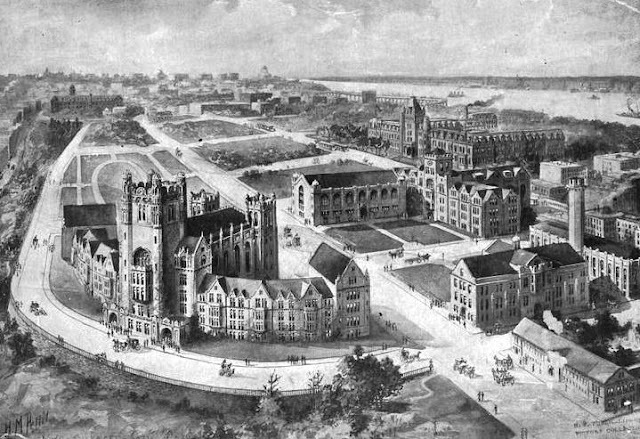 1903 view of Shepard Hall by H. M. Pettit from "King's Views of New York City"
A central tower was flanked by two wings curving off to the sides, while directly behind stood the splendid Great Hall, a cathedral-like space 185 feet long, 89 feet wide and soaring to 63 feet. Here a giant mural, "The Graduate," by Edwin Blashfield embellished the entire end wall. The structures were enjoyed not only by the students but by the public at large – free recitals on the grand organ in the Great Hall were given every Sunday and Wednesday afternoon. Over the years Presidents Taft, Wilson and Franklin Roosevelt would speak here, as well as Eleanor Roosevelt and Albert Einstein. However magnificent his design, George Post made engineering oversights. The terra cotta was treated structurally, like the schist, and there were no expansion joints to accommodate temperature shifts. 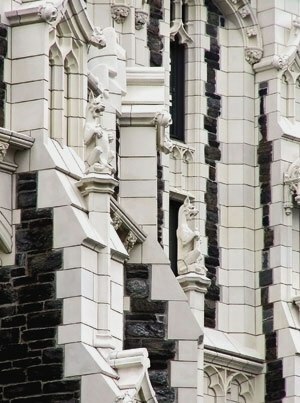 As early as the late 1920s the failure of the terra cotta was evident, causing the architects of the new Gothic Revival Compton-Goethals Hall to use cast stone rather than terra cotta to avoid a similar problem. 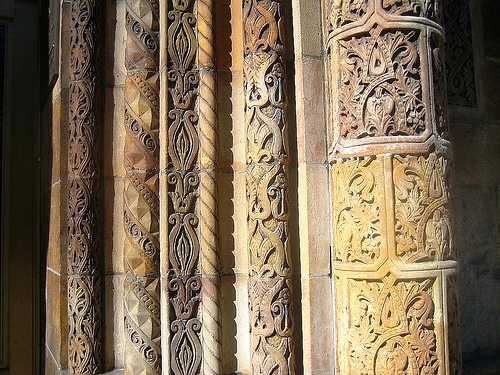 By 1986, when the Dormitory Authority of the State of New York called upon restoration architect Carl Stein to advise on the situation, the terra cotta had been breaking apart and large pieces falling loose for more than a decade. The condition of the façade was alarming at best. Only a third of the original terra cotta was in still in place. 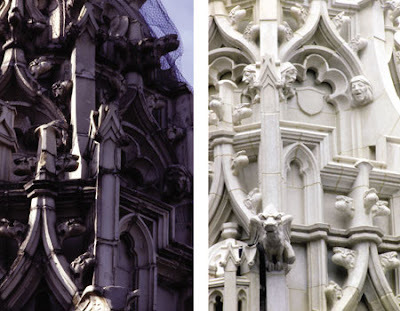 Grotesques and gargoyles were headless or missing; and voids were patched with bricks or stucco. Stein’s firm, The Stein Partnership (later to become Elemental), scrutinized thousands of elements. Of the more than 70,000 terra cotta pieces, more than half were either missing or unsalvageable. In certain cases, in order to replicate the missing elements, vintage photographs were studied. Of the reproduced pieces, 3000 of the complex sculptures were unique. Rather than using replacement terra cotta, Stein opted instead for GRFC – a complex composite of concrete, fiber glass, additives and inorganic colarants. In order to ensure visual authenticity, imperfections were included – tool marks, variations in color and other irregularities. In addition, the energy saving properties of the material, it turned out, resulted in a savings equivalent to 7,500 barrels of oil. While examining the main tower, the architects realized that due to water seepage the steel supports within the masonry had essentially corroded away to the point that they no longer existed. The tower was in danger of collapse. It was essentially rebuilt, using a precast, post-tensioned concrete structure within the masonry cladding. 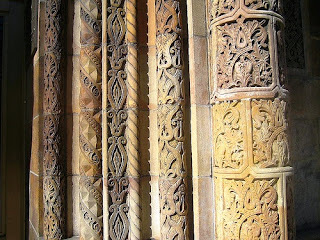 Similar problems were found in the Great Hall where pieces of terra cotta tracery from the 40-foot stained glass windows were being found on the floor. The clerestory area of the Hall was at risk of collapse and was added to the list Stein's growing list of projects. Similarly, the upper 45 feet of the separate Bell Tower required a new structural armature both to carry the replacement ornamental cladding and to safely support the 7,000-pound bell. The massive $150 million restoration is now in its third decade and approximately 80% complete. According to Elemental principal Tom Abraham it is “by far the largest historic reconstruction of its kind in the world.” The work, which was divided into ten phases, has a projected completion date of 2014. When William Banks and Henry Halsey built their prim, matching Federal-style homes at 88 and 90 Grove Street in 1827, Greenwich Village had just begun to attract families from the congested New York City to the south, lured by the fresh air and open space. The orange brick homes featured handsome doorways and paneled brownstone lintels. Wrought iron fencing protected the English basements. Thomas A. Wilmurt and his wife, Anne K. Wilmurt, purchased No. 88 in 1862 as the Civil War was raging. Wilmurt would become well-respected as “one of the oldest picture-frame and looking-glass dealers in New York,” as characterized by The New York Times decades later. Sadly, two years after moving in, the family held the funeral for their 6-year old son Walter in the parlor. By now the Federal style of the home was dated and the Wilmurts set about remodeling it in the contemporary and fashionable French Second Empire style. The style originated in Paris and quickly spread to the United States. The roof was raised to accommodate a modish mansard roof with two slightly-projecting dormers. The parlor floor windows were extended to the floor, a smartly paneled cornice board was added beneath the eave and intricate iron cresting added to the roof. Stately solid wooden double entrance doors replaced the Federal entrance on the exterior, while exquisite foyer doors with intricate acid-etched windows depicting flowers in vases were added inside. Stylish Victorian ceiling plasterwork and mantles completed the updating. 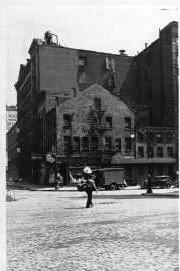 By 1880 the family had moved to 54 East 13th Street; although Wilmurt retained possession of the house, apparently renting it. Records show his taking out a 3-year, $3000 mortage on the building from the Greenwich Savings Bank on August 8, 1900. A year later, on November 19, 1901, Herbert A. Sherman purchased the house at auction for $10,500. Sherman, a major player in New York real estate (he represented the U.S. Government in the $3.5 million sale of the Custom House site in 1899 and would later negotiate the deal for Andrew Carnegie’s 5th Avenue and 91st Street property), most likely purchased the house as a rental property. Sherman, interestingly, went by his mother’s maiden name. The son of Edward Standish and Catherine Augusta Sherman, he was impressed that his great grandfather, Roger Sherman, had signed the Declaration of Independence. Vitale and his wife lived here until 1915 when the “millionaire Socialist” James Graham Phelps Stokes purchased the home; next door to his sister Helen Olivia Phelps Stokes at a much-remodeled No. 90. Perhaps because of their somewhat radical political leanings, Stokes and his wife Rose eschewed the Fifth Avenue visibility of their wealthy peers in favor of Greenwich Village charm. Although Stokes ran for several political positions as a Socialist, his wife created the most waves. The woman whom The Times once called the “storm centre of many Socialist and Communist troubles” shocked society by distributing birth control pamphlets in front of Carnegie Hall, was convicted of “seditious utterances” and was arrested at No. 88 Grove in November 1918, charged with “illegal registration” to vote. J. G. Stokes divorced Rose in 1925 when he discovered her “misconduct” with a hotel owner. The trial lasted 30 minutes. A year later he married Lettice Sands. Apparently James Stokes and his sister next door got along extremely well, because doors were cut through the common walls allowing easy access between both houses. When Helen died in 1945, her brother and his wife retained her house, using both homes as a single residence. Stokes died in 1960 and Lettice in 1988. Both homes were sold in 1996 for a total of around $2 million. Although at some point after Lettice Stokes’ death the wonderful etched glass foyer windows were removed, the rest of No. 88 was essentially intact – a Civil War period snapshot of comfortable Greenwich Village life. The buyers commissioned architect Kathryn McGraw Berry to upgrade the buildings, including bricking up the Stokes’ communal doors between the two houses. Facing the bucolic little triangular Grove Park, No. 88 Grove Street is a remarkable survivor of mid-century Victorian architecture. ﻿ In the early years of the 19th century the water supply in New York City was no longer adequate for the burgeoning population. A spring-fed reservoir at Reade and Centre Streets supplied many citizens; however wells and cisterns were still widely used. Tainted water led to disease and, finally, to the catastrophic cholera epidemic of 1832 that killed 3,515 in a population of 250,000. In November of that year Colonel DeWitt Clinton suggested that fresh water be brought into the city from the Croton River in Westchester. The State Legislature quickly established a temporary Croton Water Commission in 1833 to scrutinize the logistics of the plan. The Commission, now permanent, ordered separate surveys to be done by Douglass and another engineer John Martineau. Martineau recommended a “low bridge” using an inverted siphon system which would cost an estimated $426,027 as opposed to the high bridge at $935,745. Douglass stood firm in his preference for the monumental high bridge and, in 1836, he was replaced as Chief Engineer by John B. Jervis. Although the Commissioners and the Chief Engineer remained in favor of the low bridge, the citizens of New York wanted the more colossal, Roman-looking aqueduct. It was argued that because the aqueduct would be the most impressive public work project of its time, only a monumental aqueduct was suitable. 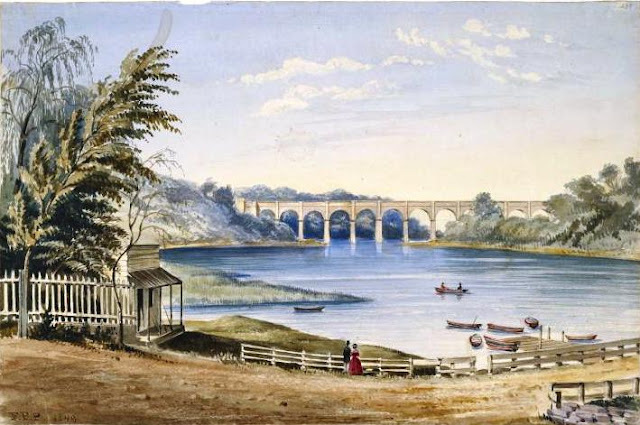 Finally in 1839 the State Legislature broke the stalemate by handing down an ultimatum: the Commission would either construct a tunnel under the river or built the high bridge. The bridge won. 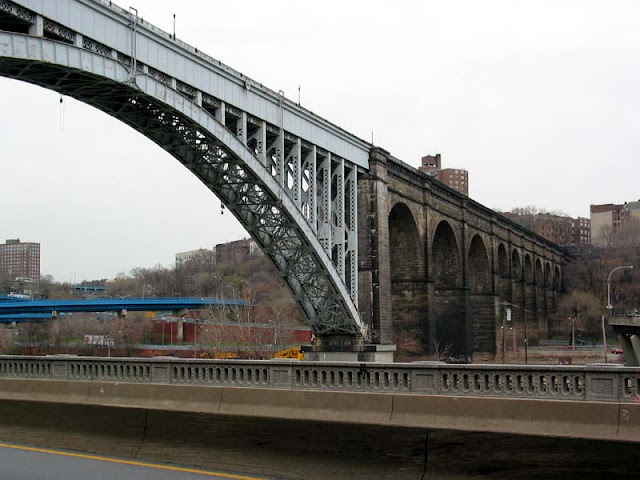 Around this time the proposed bridge, officially known as the Harlem River Bridge, began being called the High Bridge in the press and sundry reports. Fledgling architect James Renwick Jr. who would go on to design, among other notable structures, St. Patrick’s Cathedral, worked on the project. Construction began in 1837, the system using the time-tested gravity feed process which dropped 13 inches per mile to keep the water flowing. Not completed until 1848 and costing just under $1 million, the Roman-inspired structure was instrumental in furnishing clear, fresh water to New Yorkers and initiating celebrations city-wide. It measured 1,450 feet in length, with 15 masonry arches – the eight standing in the river with 114 feet clearance above the water line were 80 feet wide, the seven on land were 50 feet wide. Within only two years, however, it was evident that the two 3-foot diameter pipes were insufficient to keep the city adequately supplied. Therefore in 1860 a third pipe, 90.5” in diameter, was laid over the original two pipes and the sides of the bridge were raised another six feet. Victorian New Yorkers flocked to the scenic bridge for strolls along its pedestrian walkway and for picnics along the river banks. It was widely hailed as an engineering marvel and an architectural triumph, deemed “majestic and lofty” shortly after completion. Stereopticon slides were produced and it became routine subject matter for landscape artists. Century Magazine deemed it "the noblest civic monument in the United States." 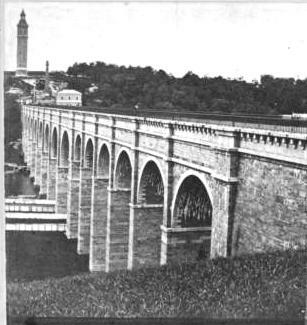 When, in 1873, the picturesque High Bridge Watchtower was constructed to equalize the water pressure from the Croton Aqueduct, the area became even more popular for weekend strolls. 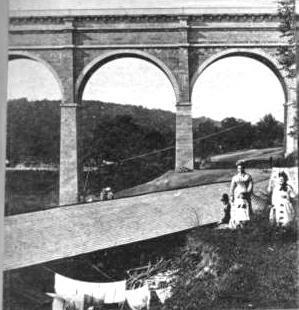 As the United States entered World War I, the aqueduct was closed down for fear that the city’s water supply could be sabotaged. Water was supplied through a series of tunnels. Shortly thereafter the Army Corps of Engineers recommended demolition of the High Bridge for enhanced navigation of the river. 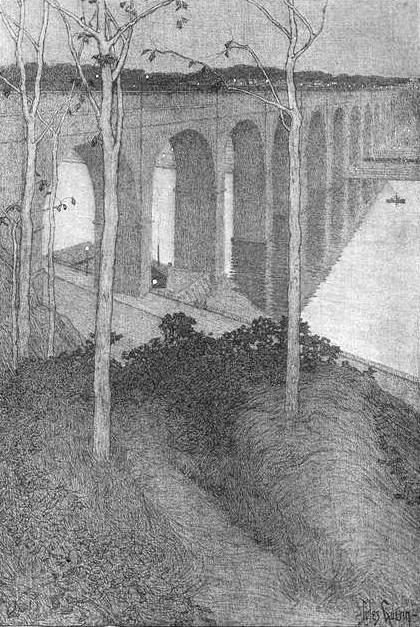 The 1927 steel-girder replacement of five stone arches to accomodate river traffic. ﻿The bridge survived albeit with a 360-foot span of five arches removed, replaced by a single steel arch. The compromise, costing about $1 million, was executed in 1927. Water still flowed over the High Bridge in 1939 when 24 million gallons a day passed over the spans. By the late 1950s, the area around the High Bridge had become neglected and the bridge itself used by vandals and delinquents. Michael Farmer, a 15-year old polio-crippled boy, was slain in the adjoining park on July 30, 1957. On April 21 of the following year, a gang of teens tossed sticks, bricks and rocks from the bridge onto a Circle Line excursion boat, injuring four passengers and a little over a week later a 13-year old girl was beaten by three youths on the bridge. In reaction the High Bridge was closed to pedestrian use. In 2009 funding began for restoration of the High Bridge which would bring back pedestrian and bicycle access. Lichtenstein Consulting Engineers and Chu & Gassman Consulting Engineers were commissioned in early 2010 to provide proposals for the restoration. In the first decades of the 20th century, Dr. Bernard Revel of the Rabbi Isaac Elchanan Theological Seminary recognized the need for a college specifically for the Jewish community. He campaigned for a yeshiva which, while recognizing the changing culture of modern times, would also embrace the traditions and spirit of Jewish religious teachings. 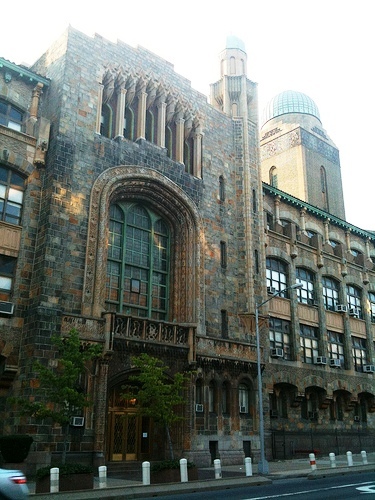 In 1928, with an enrollment of 31 students, Yeshiva College was founded. Choosing its location uptown in Washington Heights – far from its Lower East Side roots – the college commissioned Charles B. Meyers Associates to design its Main Building. Meyers adeptly blended Art Deco touches with Moorish Revival, resulting in a lush combination of pseudo-minarets, artful masonry textures, and Moorish arches and windows. The interiors boast inlaid stone floors and an auditorium with a plaster ceiling mimicking a Middle Eastern tent, enormous Art Deco chandeliers and stained glass windows. Here such illustrious figures as Golda Meir, Yitzhak Rabin, Eleanor Roosevelt, Bernard Baruch, David Ben-Gurion, Earl Warren and Natan Sharansky have spoken. Other, similar buildings were planned; however the Great Depression necessitated a halt to further construction for several decades. Despite the Depression, enrollment in 1938 had burgeoned to 578 students. In 1978, in appreciation of a $1 million donation, the Main Building was renamed in honor of Joseph and Faye Tanenbaum. The name reverted to the Main Building in 1994 and in 2001 became Zysman Hall in tribute to former Vice President of Development, David H. Zysman. Zysman Hall is a unique and fascinating structure; a rare example of the architectural style on such a grand scale. At the turn of the 20th Century, Jonathan Thorne has amassed a sizable fortune in the leather trade. As he prepared for his retirement, he planned for a sumptuous home in which to spend his later years. By 1900 marble and limestone chateaux, palazzi and palaces of New York’s millionaires rose along upper Fifth Avenue across from Central Park, replacing the stately but restrained brownstone mansions of a half-century earlier. This overt display of wealth gave the 1890s and early 1900s the designation of The Gilded Age, or somewhat more disparagingly, The Age of Ostentation. Thorne intended that his success be noticed. In his search for an architect for his new home at Fifth Avenue and 84th Street, he started at the top. C. P. H. Gilbert would be remembered as the mansion architect, and had already designed opulent residences for F. W. Woolworth, Isaac D. Fletcher and numerous mansions in Brooklyn. Construction began in 1900. 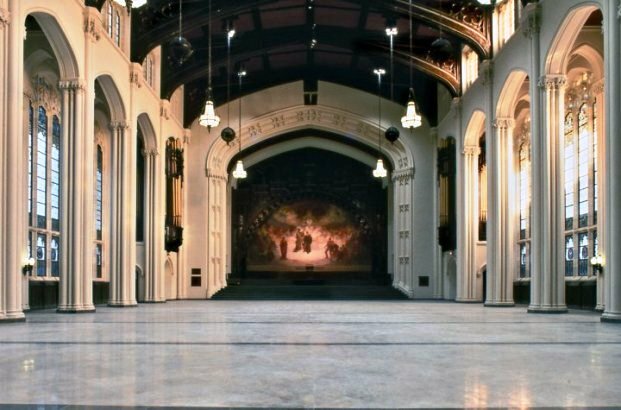 Gilbert produced a striking five-story limestone Beaux-Arts showplace over a basement protected by a sidewalk moat. While the entrance was squarely on 85th Street, Thorne retained the more impressive 1028 Fifth Avenue address. The restrained design featured a rusticated first story base supporting two floors which bowed out over the entrance and were capped by an exuberant bracketed cornice. Above the fourth floor a steep mansard roof was ornamented with wide dormers with copper pediments and detailing. As Thorne’s home was being completed in 1901, construction began on the two adjoining southern lots at 1027 and 1026. Here real estate speculator Benjamin Williams planned two impressive mansions, designed by Van Vleck and Goldsmith. The architects deftly created a continuation of the French style begun by Gilbert, lining up the mansard roofs, the cornice line and the windows so adroitly as to produce a uniform flow, while permitting the individual residences to stand on their own architecturally. George Crawford Clark purchased the mansion next door to Thorne for $540,000 and the wealthy Mary Kingsland moved into No 1026. Kingsland was the daughter of William H. Macy who had made a fortune in the whale oil business; later to be president of at least two banks. In 1919, the year that Thorne’s son, Henry Sanford Thorne, was listed as serving in the Officers’ Reserve Corps of the Army of the United States, the block changed. Mary Kingsland died leaving an estate of $10.5 million, her home at No. 1026 being sold to Dunlevy Milbank; and the Clark house was sold to Herbert Lee Pratt who set about redecorating many of the rooms. By 1936 the student body of the Marymount School had grown to the point that additional space was necessary. Pratt sold his adjoining mansion to the school in 1936. Fourteen years later, Mary Kingland’s house at No. 1026 was acquired as well. The three mansions were carefully joined, the interiors being preserved as much as possible while adhering to the necessities of an educational facility and accompanying building codes. In 1984 a gymnasium was built on the roof of the three houses and in 1994 science labs were constructed in the top floors of two of them. Despite the changes, Marymount archivist Susana Acosta stresses that the mansions have been left “pretty much as they were…in accordance with the buildings’ landmark status” which was designated in 1977. Jonathan Thorne, who intended to make a splash with his elegant home in 1901, is today vaguely remembered. 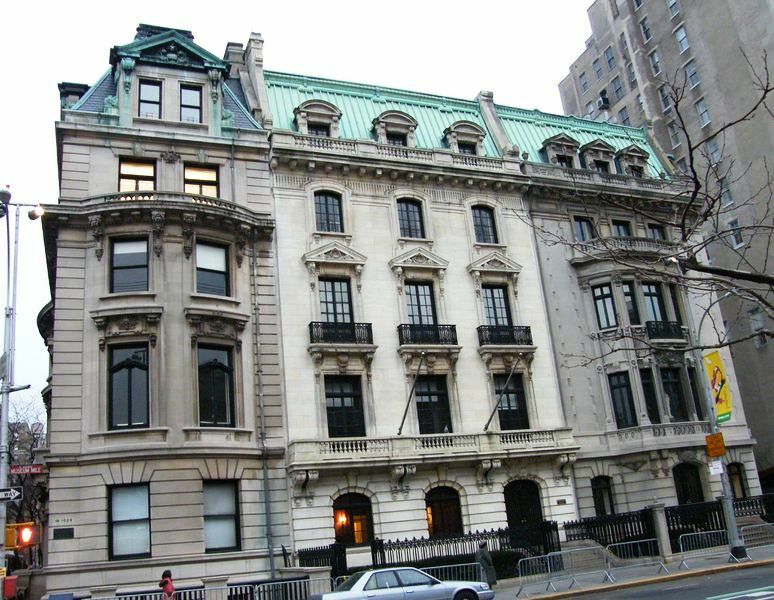 Shortly after his death the mansion became commonly known as the Florence Vanderbilt estate, and today is grouped with its two neighbors as “The Pratt Mansions.” The house is, however, a remarkable surviving example of the glittering lifestyles of New York’s millionaire class at the turn of the last century. 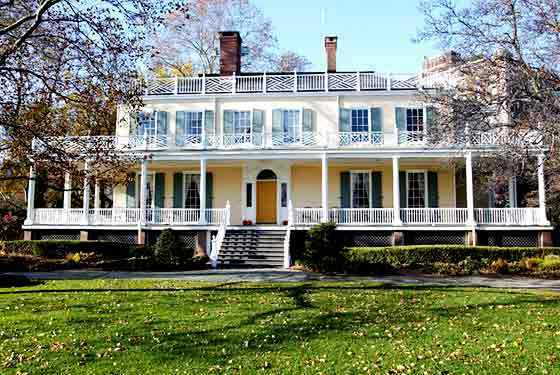 Jacob Walton’s 1770 country estate, Belview, sat on a high knoll overlooking the East River. It was ideally located for commanding river views and cooling summer breezes. It was also a spot George Washington deemed logistically ideal for defense. In 1776 the house and grounds were appropriated and a small fort erected with nine guns. On September 15 of that year, British battleships bombarded the property, completely destroying the house. The Americans retreated and the English used the property as an army encampment until November 1783, after which the estate sat neglected. In 1793 Scottish-born shipping merchant Archibald Gracie moved to New York. Before long he was wealthy, owning the largest fleet of merchant ships in New York. He purchased the large area of land from Walton’s heirs in 1798 and began erecting his gracious summer home, most likely using the existing foundations of the ruined Belview. The Gracies would have esteemed neighbors. Not far away was the country seat of John Jacob Astor, as well as the homes of the Rhinelanders, the Lawrences, Nathaniel Prime, Commodore Chauncey and Richard Riker. While the AIA Guide to New York attributes the design to architect Ezra Weeks, some historians feel it may have been the work of John McComb, Jr. who designed City Hall and whose Hamilton Grange, the home of Alexander Hamilton, is strikingly similar to Gracie’s. Completed in 1799, the elegant home was surrounded by commodious porch on both levels that caught the refreshing river breezes. Chinese Chippendale-style railings ran along the upper porch and around the roofline. The Gracies used the mansion as a summer residence and hosted lavish entertainments. The tall windows of the first floor slid ingeniously into the walls creating additional doorways so guests could easily mingle inside and out and cool night air could circulate throughout the home. In 1810 or 1811 an architecturally compatible addition was added to the house. Unfortunately, the War of 1812 dealt a crippling blow to Gracie’s finances and in 1823 he was forced to sell his estate to Joseph Foulke for $17,000; although at one time it had been valued at $60,000. Foulke, originally from New Jersey, had amassed a fortune through his successful shipping commission business. 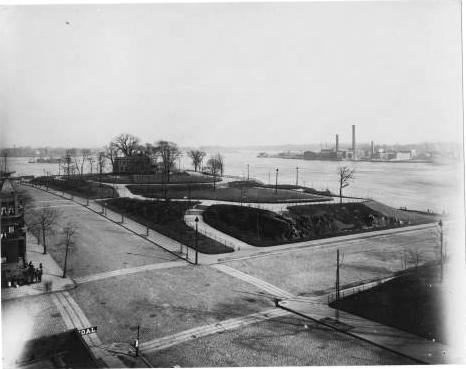 The Foulkes lived in the mansion until 1857 when it was sold to Noah Wheaton and, after Wheaton’s death in 1896, it was appropriated by the City of New York which used the surrounding 11 acres as East River Park; renamed Carl Schurz Park in 1910. Archibald Gracie’s elegant home, once the setting for glittering parties and royal guests, was now used as public toilets and an ice-cream stand. In 1922, however, socialite Mrs. John King Van Rensselaer changed all that. Mrs. Van Rensselaer was already well-known for her interest in New York history and an early crusader for historic preservation, but she was also directly descended from Archibald Gracie. Through her efforts a bill was introduced in the state legislature to give custody of the house to the Patriotic New Yorkers, of which she was president. The museum, which opened in 1924, was the beginning of the Museum of the City of New York and when new facilities were built for it on 5th Avenue1936, the Park Department ran the Gracie House as a house museum. 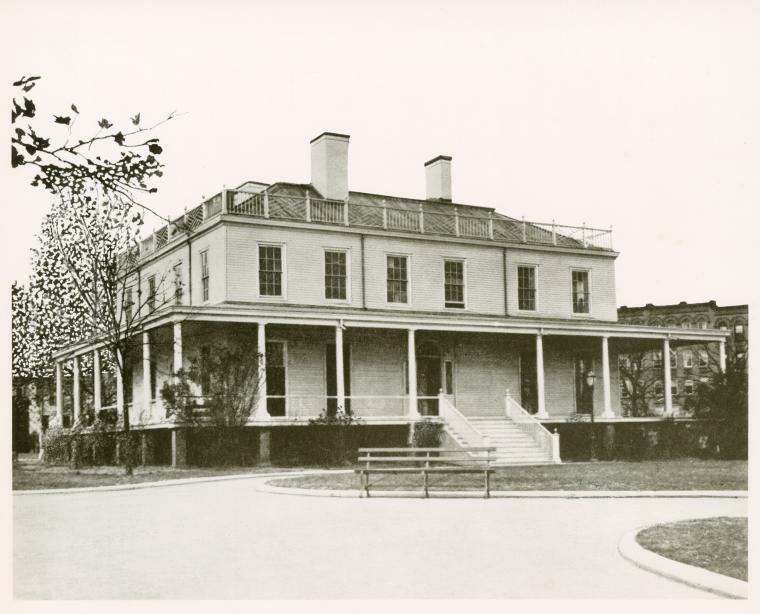 It was Parks Commissioner Robert Moses who convinced the City to utilize Gracie Mansion as the official residence of the Mayor and, after renovations and problems (The Times reported on April 6, 1942 of inadequate appropriations and priorities of wartime construction materials), Mayor Fiorello LaGuardia moved into the mansion in 1942. A year later his revised plans were better-received, The Times saying “this year’s revised design is notable for its scholarly and appropriate good taste.” The Susan E. Wagner Wing opened in 1966, including a ballroom and two additional rooms. A major, three-year restoration was begun in 1881 and another restoration in 2002. On Christmas Eve in 1867, as New York was recovering from the troubles of the Civil War, black New Yorkers were welcomed into the parlor of the house at 499 Broome Street where the city’s first Sunday school for non-white adults was held. “The institution of this school is the praiseworthy result of the labors of a widow lady during the past four years,” reported The New York Times. “Much has yet to be done to render it efficient to the extent desired and needed among a population of 2,000 colored people who surround it.” The “widow lady” recruited the services of Rev. T. P. Wilds as superintendent of the school. The handsome brick house had stood on the corner of Broome and Laurens Streets since around 1825, when the neighborhood was first plotted out and developed. As the population of the city jumped from 100,000 in 1810 to 160,000 in 1825, comfortable homes for the successful merchant class began lining the blocks north of City Hall. Among them was No. 499 Broome Street, a roomy 3-1/2 story Federal building with a dormered attic. The dignified dwelling would have been entered through an elegant doorway, mostly likely flanked by twin ionic painted pillars, narrow sidelights and a leaded overlight. Wrought iron fencing would have surrounded the basement and led up the brownstone steps. As the 19th century progressed, the residential tone of the neighborhood changed. 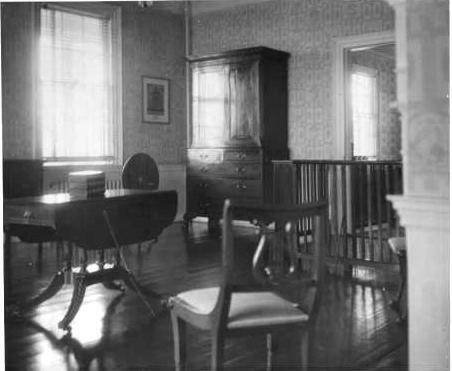 Families moved northward and their distinguished residences were renovated for commercial purposes, the parlor floors becoming workshops or stores, with warehouse or factory space in the upper stories. Such was the case with No. 499 Broome Street. In the late 1870s or early 1880s, an addition was built to the rear of No. 499 Broome Street on what was now West Broadway (the name being changed in 1868 when Laurens Street and West Broadway were connected). Although the interiors were stripped out of the main house and the first floor was altered beyond recognition, the architectural integrity of the Federal building was, overall, preserved. By 1917 there was a café on the first floor of what had been the "widow lady’s" house with “factory lofts” on the second and third floors; and this was essentially how the quaint structure would be used throughout the 20th century. 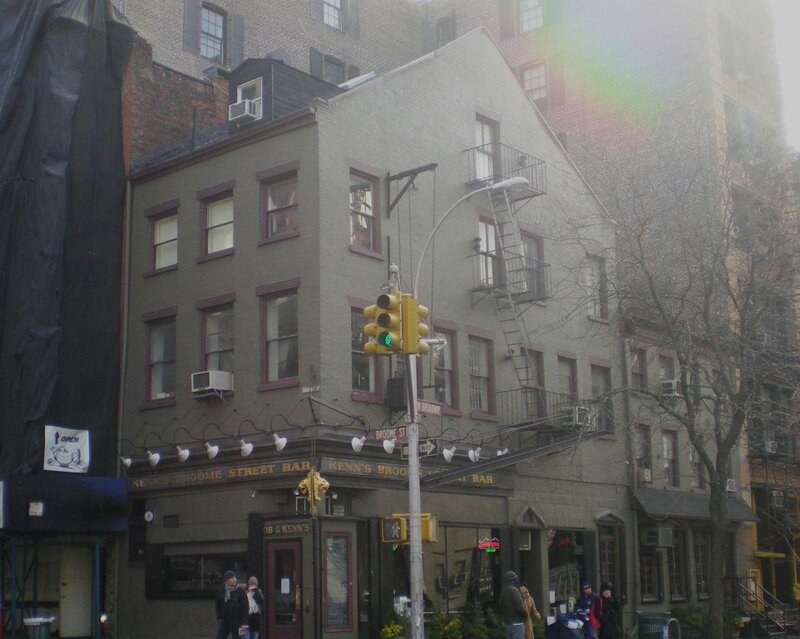 In 1972 Kenn’s Broome Street Bar, a tavern serving “bar food,” opened with the side-door address of 363 West Broadway. More than 30 years later the bar remains a familiar meeting place in Soho on a street much changed since 1825. Although the house is now dwarfed by the tall buildings crowding around it, it is still easy to imagine a time when similar houses lined the streets and a widow lady shared Christmas carols in her parlor. Plans were drawn up for a new, state-of-the-art Fire Headquarters at 157 E. 67th Street, next to the planned 28th Precinct station house. 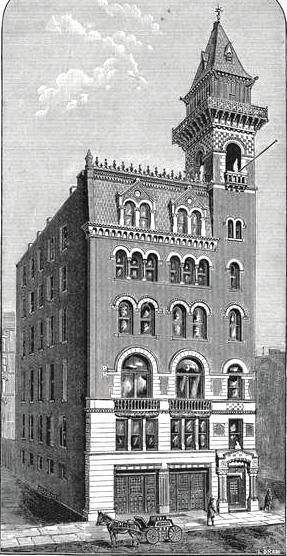 Napoleon LeBrun & Son had begun designing New York City firehouses in 1879 and for this one the architect chose the currently-fashionable Romanesque Revival style. Cost estimates in 1885 were about $125,000 with another $50,000 required “to paint it, warm it, ventilate it, furnish it, and finish it up ready for use.” Using brownstone (from “Kocher’s quarry”), Philadelphia brick, copper cresting and iron, LeBrun utilized arched windows, a slated mansard, and an imposing corner lookout tower and belfry to create an imposing structure. The Fire Department intended the new headquarters to be outfitted with the most modern equipment. An Otis elevator would be installed and both “the engine and truck companies will be equipped as no fire companies are at present.” The second floor would house the dormitories, the third would contain the offices of the Commissioners and their clerical staff and the fourth floor would hold the offices of the Superintendent of Buildings, the Bureau of Combustibles and other functionaries. 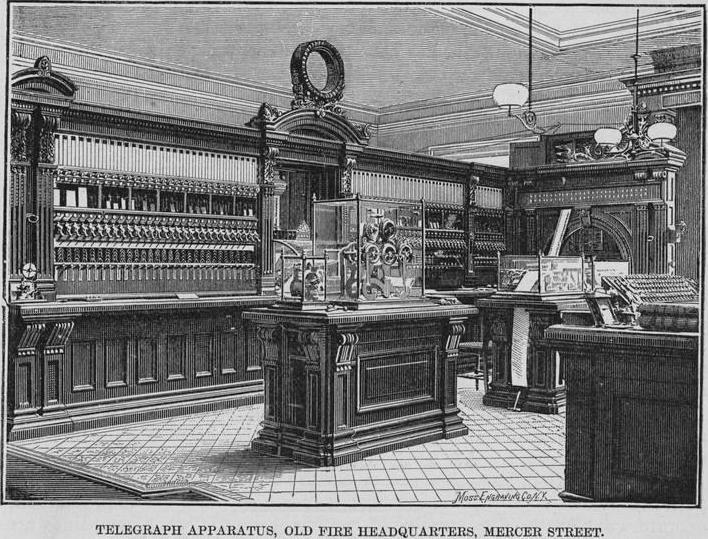 The telegraph apparatus would be installed under the mansard roof. The building would also include a gymnasium and a drill yard in the rear. On April 16, 1887 the headquarters was officially opened with a reception. The mayor and other dignitaries were given demonstrations in the rear yard and “held their breath as the gallant Life-Savings Corps went up the flimsy ladders like so many monkeys” and a stream of water was streamed over the housetops, according to The Times. 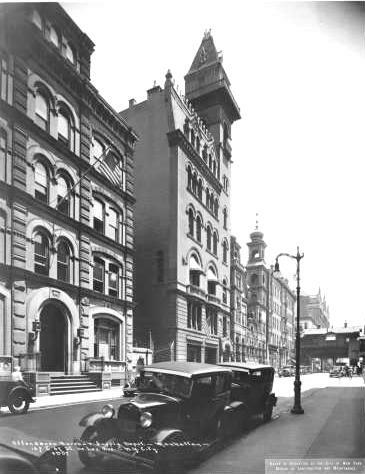 The Fire Headquarters, with its tower still intact, in 1920 with the Police Station House in the foreground - NYPL Collection. During this time Pinkie was the “coach dog” of the firehouse for years. Dave Oates, the engine driver, made a miniature bunk for him next to his own and at the sound of the fire alarm Pinkie would leap to the front seat of the engine next to Oates for the ride to every fire. Pinkie died in March of 1907 when a fireman sliding down the fire pole landed on the dog, breaking his back. In 1914 the headquarters moved out, being replaced by the Board of Education offices; although the Engine Company 39 and Ladder Company 16 remained as did the training center. However, in the 1970s a planned expansion of Hunter College threatened the building, as well as the old police station next door. 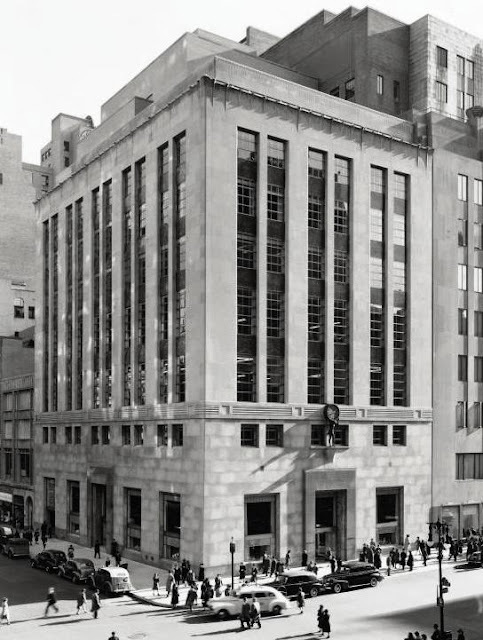 Although the Landmarks Preservation Commission quickly landmarked the buildings in 1980, the City countered the move, reversing the designation, deeming the aged structures ineffective. Citizens' groups and the Landmarks Preservation Commission faced off in a stalemate with the City. After no fewer than five suggested compromises were turned down, a proposal by restoration architect Carl Sterin put forward the possibility of demolishing only the rear portions of the vintage buildings, connecting them and restoring the facades. The revised college expansion would be executed separately from the buildings. Completed in 1992, the renovation provided use of the upper stories of the fire headquarters building to the newly-connected 19th Precinct. The fire headquarters had suffered considerably throughout the 20th Century -- the top of the lookout tower was gone and the brownstone was seriously deteriorated. The façade was completely restored, including cast-stone replacements for the damaged brownstone. 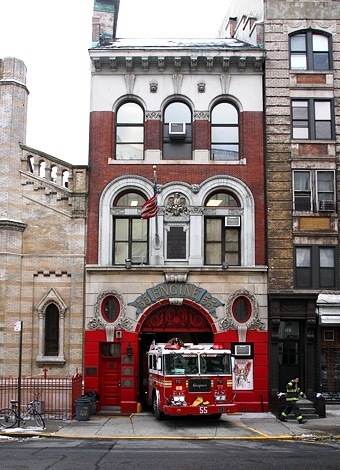 Six years later the fire headquarters building, which the Landmarks Preservation Commission called “an outstanding example of late nineteenth century civic architecture,” was re-designated a New York City landmark and continues to this day fulfilling the needs of the city. When Peter Herter came to New York from Germany in 1884 he was, according to The New York Times “the richest builder on the banks of the Rhine.” Herter and his brother Francis established an architectural firm, Herter Brothers (not to be confused with the interior decorating firm of the same name), and set about constructing dignified tenement buildings for immigrants in the Lower East Side. The Herters approached tenement housing differently that most builders and architects of the time. 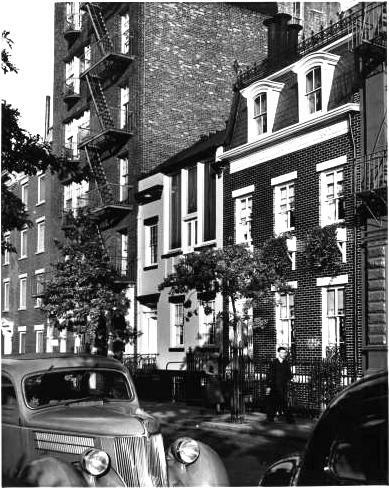 Peter defended the oft-maligned structures saying “flats, apartments, everything of that kind…from the humblest to the grandest, are, legally speaking, tenement houses.” The more acceptable French flats and apartment buildings rented for $20 or more per month; tenements were less expensive, the humble homes of the working class. 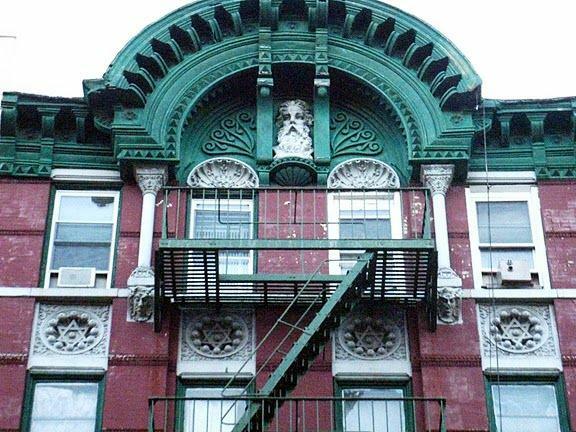 Unlike most other tenement buildings, those designed by the Herters were embellished with ambitious ornamentation, their rooms were generally larger and they offered a bit more self-esteem to the lowly renters. 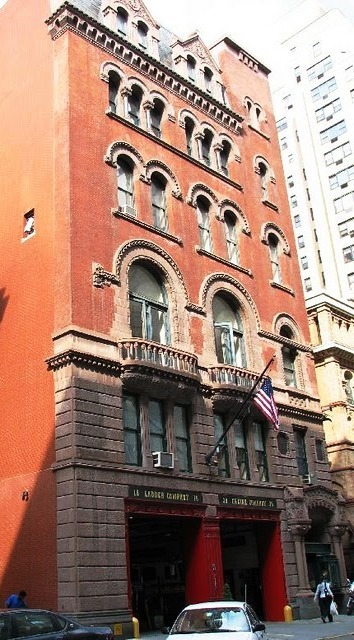 Such a building was 375 Broome Street, erected around 1890. Using red brick, limestone and terra cotta the brothers produced a visually entertaining façade. Four bays wide, each of the six floors is separated by a stone course and the windows treated differently on each story. Rich terra cotta shells within arches cap the third floor windows, pronounced triangular pediments sit above the two outside windows of the fourth floor while shells without the arches ornament those in the center, and most strikingly large Magen David –or stars of David – set in ornate plaques set off the fifth floor. The center two bays are recessed slightly for visual appeal. Two slim free standing Corinthian columns stand on carved stone brackets in the shape of classical heads, supporting a robust, deep pressed metal cornice. Within the cornice a large bust of, presumably, Moses looks out onto the passersby. 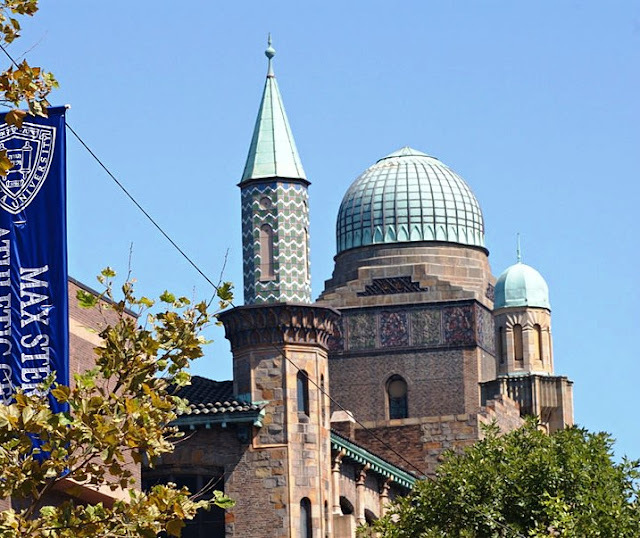 The Jewish connection can be argued when one considers that Peter and Francis designed the elaborate Eldridge Street Synagogue around the same time. However the names of the residents reflect a mixture of backgrounds. 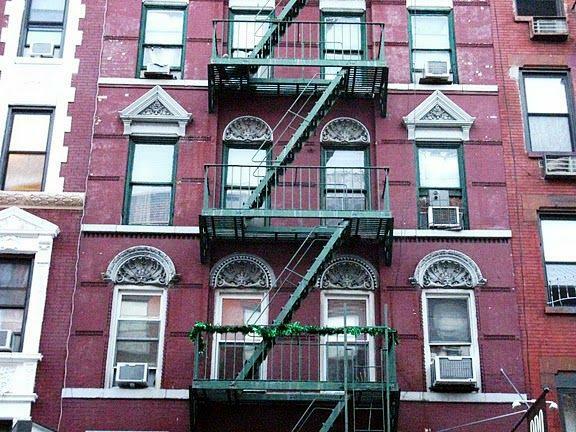 In 1896, Elizabeth Orth was living here when, while talking with a neighbor Rocco Bruno, she was insulted by “a tramp” which resulted in a “rough-and-tumble fight on the sidewalk,” according to the press. By 1910 an Italian restaurant occupied the first floor, run by F. Pigniolo, and among the tenants were Mrs. Amelia Morrita with her son Giuseppe and daughter Antonina, and neighbor Angelina Fenadi. On November 7 of that year Salvatore Ricco was painting the rear of the restaurant when a gas jet ignited his paintbrush, which he dropped into the paint pot causing a conflagration. The flames swept up the air shaft to the roof and while a passerby ran to nearby Engine Company 55, a policeman worked to evacuate the residents. The fire damaged the second and third floors, causing an estimated $10,000 worth of damage. 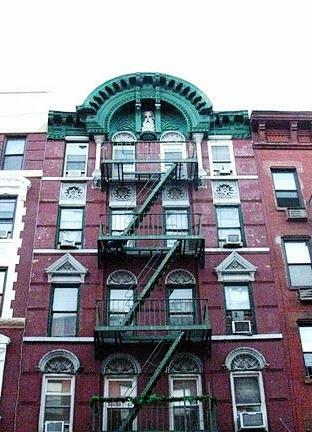 Throughout the 20th century 375 Broome Street carried on the tradition for which it was built – relatively inexpensive apartments for working class renters. Today the ground floor is home to Quan Sushi and Oro Bakery and Bar and while the multi-cultural neighborhood is much changed since the 1890s, the Herter Brothers richly-decorated tenement building remains nearly unaltered. In 1872 Austrian immigrant Joseph Keppler began work as an illustrator for Frank Leslie’s Illustrated Newspaper. He formed a friendship with the print shop foreman, Adolph Schwarzmann, and eventually the two conceived of a German-language humor magazine. A month after Schwarzmann left to open his own printing business in August 1876, the pair formed a partnership and published their first edition of Puck. Schwarzmann provided the financial backing while Keppler came up with the editorial content and illustrations. The magazine was an instant success and a year later an English version was simultaneously printed. While it supported the Democratic party, the publication was non-partisan in its satire. Political corruption, the latest fashion trends, labor unions, suffragists and “all forms of graft, extravagance and unjustice” were fair game for the editor’s sharp wit. Full-page cartoons printed in color (exceedingly unusual at the time) were most often drawn by Keppler. As circulation grew Puck assembled a staff of talented comic writers and cartoonists. From its start Puck used the services of the J. Ottman Lithographic Company to produce the lithographs. With the growth of Puck, Ottman’s business burgeoned as well. In March 1885 Ottman, Keppler and Schwarzmann joined together to purchase the property in the publishing district on the southwest corner of East Houston and Mulberry Streets where they would erect a building to house their two businesses. A year later the massive building was completed. 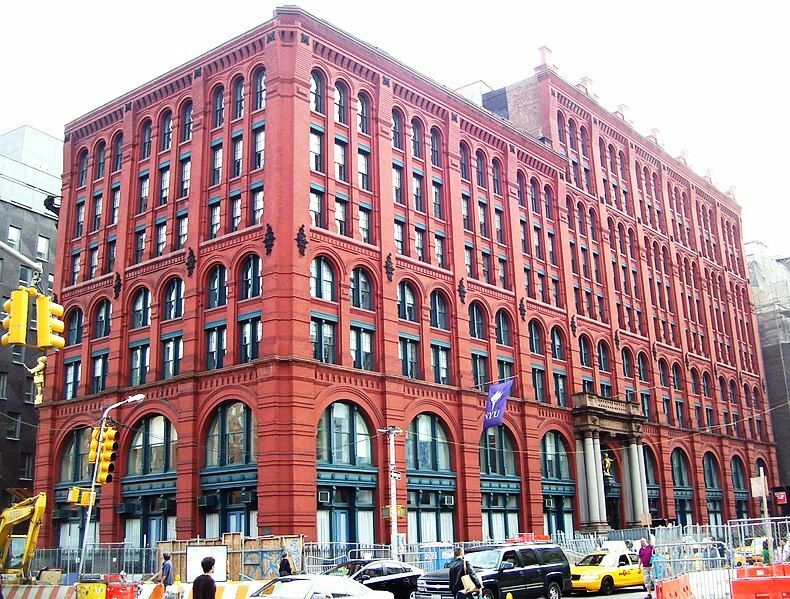 Designed by Albert Wagner it was a great red-brick Romanesque Revival pile, the largest of the publishing house buildings. Wagner visually separated the seven floors into three sections by filling equal-sized piers with variant-sized arches: single two-story arches on the first level, double two-story arches on the second, and triple three-story arches on the third level. Decorative cast iron masonry supports and window frames, corbelling of the cornice, and light-hearted sculptures of Puck (for which Keppler’s daughter reportedly posed), added the necessary material contrast. Although construction took less than a year, it was not without problems. In September 1885 the foreman of the bricklayers, Patrick Cavanagh, was fired for drunkenness. A few days later when he had not yet returned home his wife found him in Gilligan’s saloon near the Police Headquarters, drinking with John Sweeney. Mrs. Cavanaugh, “after berating her besotted husband, struck with a bottle John W. Sweeney, who was helping him to spend his money,” reported The Times. On June 25, 1887 tenants included, in addition to Puck and the Ottman concern, G. P. Baldwin’s bookbindery; Robert Hornby’s electrotyping company; Stadecker & Emsheimer, hat frame manufacturers; H. Lindenmeyer, paper dealers; and on the first floor the hat store of Twest & Co. On that evening a fire originated in Baldwin’s offices and quickly spread. The large amount of inks, glues and paper in the building ignited into a major conflagration, not being fully extinguished until hours later, causing around $30,000 in damages. A final alteration became necessary when the city decided to extend Lafayette Street, its route cutting through the western portion of the building. The new western façade was designed by Wagner, however he died in 1898 and Herman Wagner, a relative, and his partner Richard John finished the job. Interestingly, the smaller sculpture of Puck over the original west entrance was duplicated rather than moved. Although Puck magazine did not survive the First World War, the Puck Building remained a constant presence throughout the 20th Century, relatively unchanged. The large gilded statue of Puck by sculptor Henry Baerer, on the northeast corner of Houston and Mulberry is a favorite among New Yorkers and a surprise to visitors. In 2004 New York University acquired three floors (75,000 square feet) of the building for its Wagner Graduate School of Public Service and the Department of Sociology. Large areas have been reserved as event venues on the ground and topmost floors. 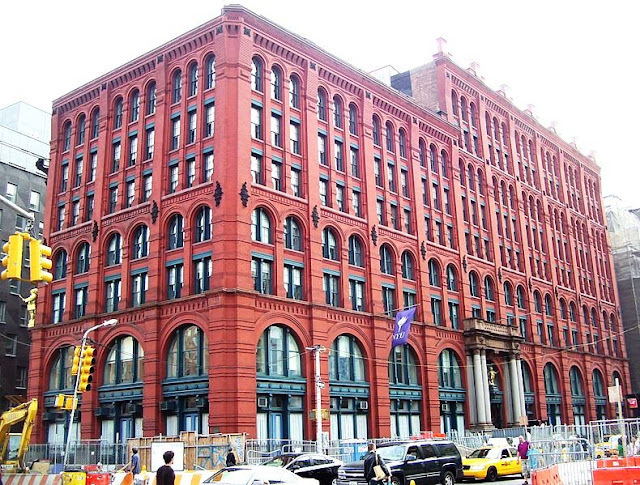 In the televised sit-com Will and Grace, Grace’s design office was situated in the Puck Building. ﻿In the years leading up to the Civil War, wealthy New Yorkers began erecting brownstone mansions in the newly-fashionable Murray Hill neighborhood. Shipping merchant Charles Fox purchased three lots on East 38th Street as speculative investments in 1859 and three years later had built a trio of handsome four-story rowhouses. Richard and Mary Poillon purchased No. 36 East 38th Street and moved in with their six children. Poillon, at 44-years old, was a successful shipbuilder. Having learned the trade from their father, Richard and his brother Cornelius had opened their own business, building ferry boats and steamships. With the outbreak of the war, they would grow even wealthier constructing gunboats and blockade steamers. In July 1891 Richard Poillon died of pneumonia after a three-month illness. Mary stayed on in the house until her death in 1901. That year No. 36 East 38th Street was sold to Middleton Shoolbread Burrill and his wife, Emilie. An esteemed attorney, Burrill traced his ancestry to eminent colonial families – the Burrills, the Draytons and the Middletons. The couple was socially prominent, their names appearing regularly in the society pages. The residence that the Burrills purchased was spacious and elegant; but they felt the pre-war architecture could use updating. They commissioned architects Hoppin & Koen to renovate and enlarge their home. The designers worked with the owners, drawing and redrawing the plans – three amended sets of applications being submitted to the Department of Buildings in the summer of 1902. Finally a plan was settled upon. An additional floor would be added and a completely new façade built to replace the original brownstone. Hoppin & Koen had already established a reputation for elaborate country homes in the Beaux Arts style. For the Burrill house, they created a lush but restrained façade. Without resorting to the dripping garlands and wreaths prevalent on so many homes executed in the fashionable style, they managed to reflect the owners’ wealth and social position. 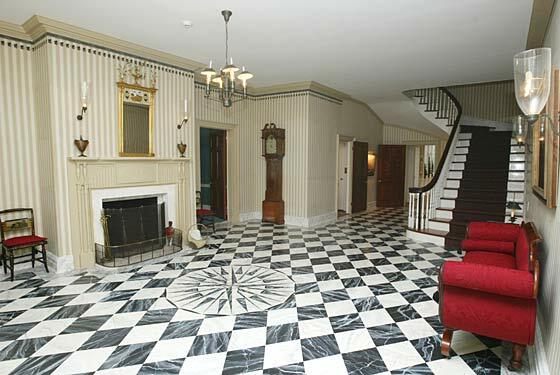 ﻿The basement and parlor floors form a rusticated limestone base. A wide staircase sweeps up to the porch, gracefully curving on one side. Above the three identical arches the second and third floors rise in red Philadelphia brick behind a stately stone balustrade balcony. The three stone-framed second story windows are capped by classic closed pediments. The copper mansard roof sits above an ambitious stone cornice with a copper balustrade. Three robust copper dormers completed the design which draws on both French and English models. The Burrills were actively involved in thoroughbred horses and in 1906 built a sprawling summer estate in Jericho, Long Island where the annual Meadow Brook point-to-point races were held. On April 8, 1913 their 20 year old daughter, Leonie, was riding in Central Park when her horse became frightened and bolted. After a ten-block struggle with the horse, Leonie was thrown headlong from the horse onto the asphalt and seriously injured. She was taken to the Presbyterian Hospital where she recovered some time later. The grateful Burrills donated $72,000 to the hospital’s building fund in 1924. 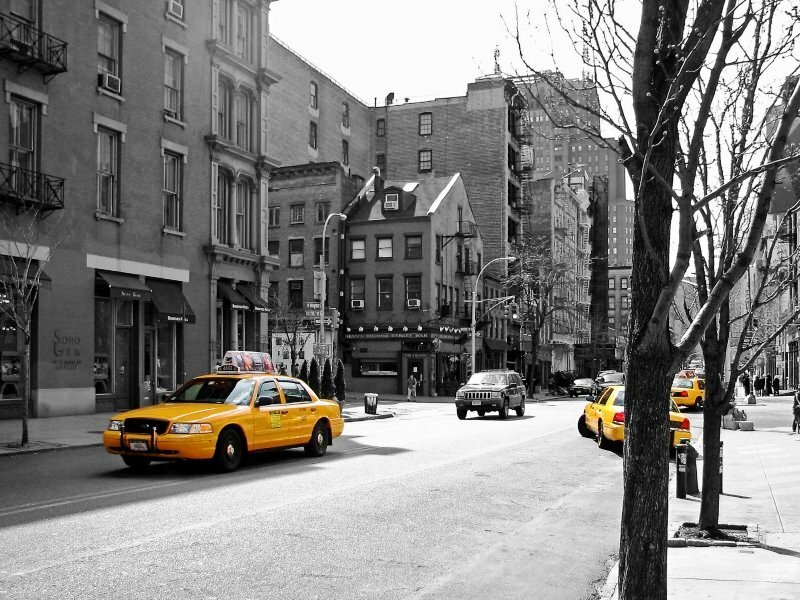 By this time the Murray Hill neighborhood was changing. Most of the large homes were being converted to rooming houses or commercial offices. In 1929 the Burrills left No. 36, moving into a Park Avenue apartment and leasing the house as an upper-class rooming house. Here, two days before Christmas in 1934, recent debutante Deane Ashton Libby committed suicide by gas in the kitchenette of her two-room apartment. As the 1930s drew to a close, Lena Tateosian leased the house, converting it to apartments and rooms. The Building Department noted in 1938 that there were four furnished rooms each on the parlor, second and third floors, one on the “penthouse” level, and one apartment and two furnished rooms in the basement. After Mrs. Burrill’s death, Irving Greenberg purchased the house in 1945 and hired architect Sidney Daub to covert it to apartments. By 1949 there was a doctor’s office and apartment in the basement, a doctor’s office and apartment on the parlor floor and four apartments each in the upper stories. Through it all, the outward appearance of the home remained essentially unchanged. Today, while still an apartment building, the magnificent façade retains the stately quality the Burrills sought. The house was designated a New York City landmark in 2010. Napoleon LeBrun and his sons had designed approximately 40 firehouses for New York City from 1880 to 1895; many of them highly ornate, lavish structures modeled after French chateaux or Italian palazzi. Therefore, when architect R. H. Robertson was given the commission to design the new house for Engine Company 55 in 1898, he had a difficult act to follow. The Italian 14th Ward neighborhood where the new fire station would rise, at 363 Broome Street, was impoverished and tough. Reformer Jacob Riis and travel guide author Frank Moss used words like “foul” and “vice” in describing the area. Robertson submitted his plans to the Department of Buildings on July 13, 1898, depicting a brick and Indiana limestone façade with a copper-tiled mansard roof. A hose tower was to rise 56 feet from the sidewalk. The ground floor interiors were lined with Guastavino glazed-tile arches which were not only attractive but easily cleaned. Eight months after construction began the building was completed in March 1899. 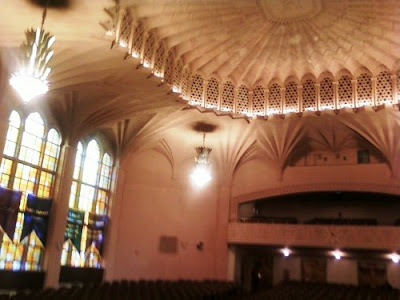 Like the LeBruns, Robertson produced a sumptuously decorated structure. The three-story fire house is a mix of Romanesque Revival and Beaux Arts styles – both at the height of their popularity at the time. The rusticated limestone first floor is dominated by a central arched doorway, over which a carved-stone ribbon in relief identifies the house: 55 ENGINE 55. On either side, decorative oval windows are framed in heavily-carved stone wreaths. Two large arched windows on the second floor are joined by a connected smaller arch in which a bronze plaque was inset, inscribed with the architect, the fire commissioner, and the chief of department. A terra cotta phoenix roosts above the plaque. The windows of the third floor mimic the three arches below, separated by brick Corinthian pilasters. Two lion’s heads stare down to the street from below the cornice. Robertson’s intended mansard roof did not survive the pre-construction revisions. Prior to World War I the neighborhood had not improved significantly. Around 8:00 pm on December 4, 1909 a hungry fireman, Albert Robinson, called upon a “buff,” gave him a quarter and sent him to a nearby restaurant for a can of coffee and some food. Buffs were hangers-on at the fire stations; young boys who admired the fire fighters as heroes and did errands and favors for them. The boy had barely left the Engine Company door when Robinson heard his cries and ran out to find several “Italians who were beating him and trying to take the quarter away from him.” When the fireman joined in the fray, followed by other firemen, he was stabbed in the back with a 7-inch stiletto. Robinson was taken to St. Vincent’s Hospital; Vincenzo Curso, the man with the knife, was arrested for felonious assault; and Acting Battalion Chief Jennings rushed to the station to investigate. While the Chief was inside with the firemen and police, his driver Thomas Roe, waited outside in the buggy. Hearing a commotion, the group ran out to find Roe surrounded by “several Italians” who were beating the driver. In September 1927, Wesley Williams was a member of Fire Company 55 when he was summoned to the office of Fire Commissioner John J. Dorman. At 2:30 pm on September 15 Williams was promoted to lieutenant – the first African American supervisor in the New York City Fire Department. By the time Williams retired on May 27, 1952, he was a Battalion Chief and the highest ranking African American fireman in the country. Fire Engine Company 55 still calls the 1899 station house home. The neighborhood, once so heavily Italian, is now part of Chinatown. 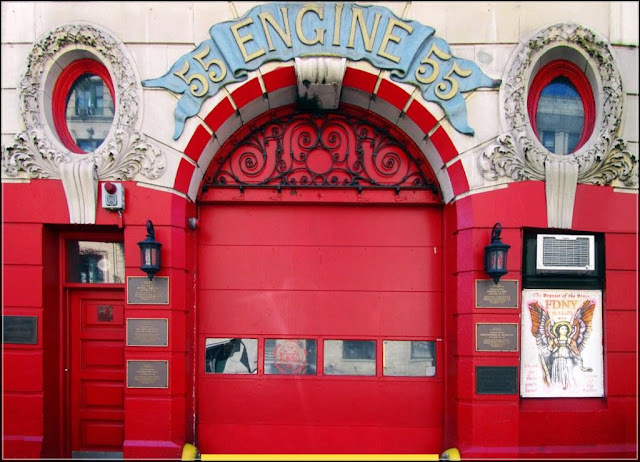 Bright red paint covers part of the limestone ground floor and the original entrance door has been replaced; however R.H. Robertson’s ornate fire house – the only one he designed for the New York City Fire Department – retains its 19th century architectural integrity. ﻿Charles Tiffany, during the midst of America’s first great depression, opened his first small store across from City Hall in 1837. His business thrived and ten years later he moved across the street to 271 Broadway. 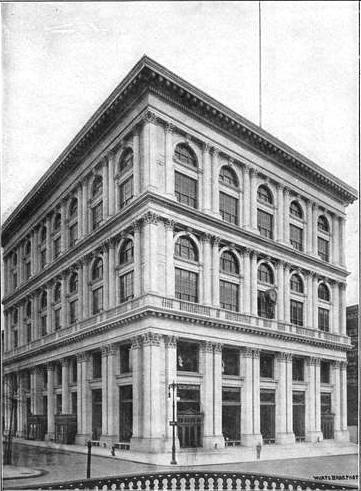 By 1853 Tiffany & Co. had established itself as a leader in the quality jewelry trade and Tiffany built an impressive new building at 550 Broadway. Feeling that the façade was “monotonous,” he commissioned his good friend Henry Frederick Metzler to carve a 9-foot tall figure of Atlas to be situated over the entrace, holding a clock, four feet in diameter. Metzler was a carver of ships' figureheads, or “bow portraits.” The bearded, lanky figure was a distinct departure from the hulking, muscular Atlases produced by most contemporary artists. Naked except for a crossed leather strap, Metzler’s Atlas does not bend under his burden, but stands upright and dignified. The left foot is poised to take a step off the statue’s base. The carver did not attempt to present an heroic figure and instead created a realistic, natural human form; a masterpiece of woodcarving and design. When completed, the wooden Atlas, carved of fir, was painted to mimic the patina of weathered bronze. 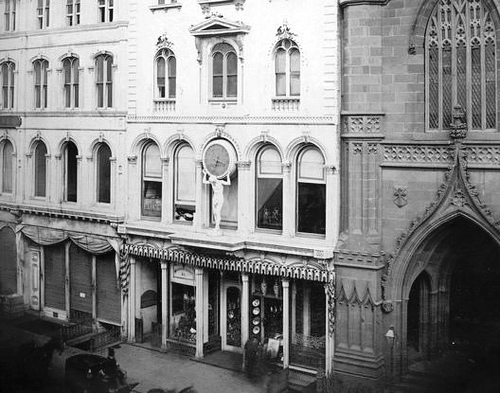 Seventeen years later, in 1870, Tiffany & Co. followed the uptown movement of the retail establishments and opened a grand new store on Union Square. With the move came the clock, which was installed directly over the main entrance in a window opening. 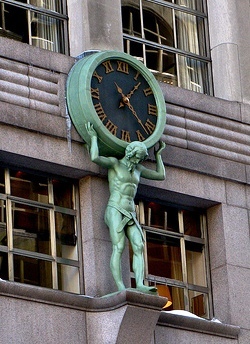 For 35 years the Atlas clock served shoppers and businessmen rushing along busy Union Square until Tiffany & Co. moved once again – this time to the imposing white marble palazzo designed by Stanford White on Fifth Avenue between 36th and 37th Streets. By now the Atlas clock was as much a symbol of Tiffany as was the robin’s egg blue box. With the clock on the façade, there was no need for advertising. In 1980 Tiffany & Co. introduced the Atlas wristwatch, based on the design of the iconic clock outside. Atlas was removed in 1990 for restoration and again in 2006. After more than a century and a half, Henry Frederick Metzler’s functional sculpture remains a fixture on Fifth Avenue and a priceless symbol of a firm. Amazingly, the mid-Victorian design is comfortably compatible with the streamlined façade on which it rests. Labels: Henry Frederick Metzler, new york architecture, New York Landmarks, Tiffany and Co.